October 1933....There’s an old mantra that goes something like this “When you hear hoof beats…look for the horse not a zebra.” Basically it translates into: consider the most likely answer first rather than searching for the rare or exotic. However as Sherlock Holmes noted, “When you have eliminated the impossible, whatever remains, however improbable, must be the truth." 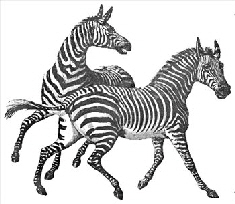 And so the truth was on a sleepy October afternoon in 1933, the little village of Gambier, Ohio had not one, but a whole herd of zebras stampede through. It was the Terror Gang, the first group of outlaws who ran with John Dillinger. Gambier was way off the beaten track. Not many folks at the time believed that big city gangsters could even find their way into town let alone bother to rob the little bank. And unless you lived in the immediate area, chances were good that you wouldn’t have heard about the hold-up. The amount of money stolen was chump change by Dillinger gang standards, definitely not the stuff of newspaper headlines. Even the timing was bad. Gambier was shoehorned between the brazen St. Marys job of Charles Makley’s hometown bank three days earlier and the murder of Sheriff Jesse Sarber which happened during the jail break of John Dillinger six days later. The identities of the robbers never came out until well afterwards. By then the public was on to bigger and bolder exploits from Harry Pierpont, Russell Clark, John Hamilton, Charles Makley, and the remaining Michigan City escaped convicts. Besides the slim pickings and lack of publicity, I’d be willingly to bet that this robbery sure wasn’t in Charles Makley’s list of all time winners. A couple of Gambier’s fine citizens tried to shoot it out with the gang, a situation that Makley avoided whenever he could. On the surface there wasn’t much to brag about. But there probably would have been a time a few months later that while awaiting trial Charles Makley would have gladly owned up to leading the robbery of the People’s Bank of Gambier instead of trying to dodge a murder rap. Gambier is located in the northeastern portion of central Ohio. The area was (and still is) predominantly rural. Its major claim to fame is Kenyon College, a liberal arts institute which was founded in 1824. Up until then there had never been an armed bank robbery in the entire county. But on Friday, October 6th, 1933, at 2:30 PM all that changed. Four armed men entered the People’s Bank of Gambier while a fifth man stayed outside with the car running. There were two bank employees and two customers inside. Their timing was good since the county sheriff and one deputy had left earlier in the afternoon to take a patient to the insane asylum in Columbus, Ohio. The remaining deputy received a suspicious call to the other end of the county just fifteen minutes before the robbery took place. The de facto leader, later described as being forty-five years old and nattily attired in a dark suit and felt hat, ordered everyone to “stick ‘em up”. The bank’s cashier, Ray Brown, ignored the command, instead grabbing a revolver and squeezing off three shots at the leader. All three bullets missed their mark. Undeterred, the leader answered back with shots of his own. Evidently, he had the better aim or luck. Cashier Brown was wounded in the hand which caused him to drop his revolver on to the floor. During the shoot-out, the other three gang members, who appeared to eyewitnesses as being younger than their leader, calmly scooped up whatever money was in sight, but basically ignored the inner safe of the vault where most of the money was being held. Once the cash was gathered, a quick discussion took place about the matter of hostages. At first both employees, Brown, and Alice Hall along with the two customers, Grant Dwyer and Jay Biggs were going to be abducted. It was finally decided to travel “light” with only Cashier Brown dripping blood from his wounded hand being forced to come along. At the doorway of the bank, a running gun battle started. The owner of a tin shop across the street from the bank had heard the gunshots fired inside. He dug out his shotgun, ignored the hostage and proceeded to blast away at the bandits as they headed towards the getaway car. A blaze of bullets from the gangsters caused the shopkeeper to hit the deck while the driver floored it and the DeSoto flew out of town. Luckily the tin shop owner had ducked in time. Thirteen lead slugs were dug out of the front of his establishment afterwards. Just outside of Gambier, less than a quarter of a mile away, Brown was dumped out. During his brief trip as a hostage, he noted the inside of the DeSoto was equipped like a “young arsenal”. Meanwhile back in Gambier, Paul Ralston, who was described as a “special deputy” and his buddy, Frank Armstrong, heard the shooting and jumped in Armstrong’s car to find out what was going on. They came upon Cashier Brown, who was walking back into town. When they saw that he was bleeding, they slowed down to help him. It was a good idea in principal but the execution was flawed since neither Ralston nor Armstrong happened to be armed. Apparently in the heat of the chase, no one remembered that little detail. Undeterred, the duo followed after the fleeing outlaws and got within a hundred yards of them when the DeSoto came to a sudden halt. Armstrong jammed on the brakes as one of the gangsters stepped out of the car. Realizing what was about to happen, Armstrong tried to throw the car into reverse as the outlaw opened fire with an automatic rifle. A bullet penetrated the hood and lodged in the speedometer directly in front of him. Amid the whizzing bullets, Ralston jumped out of the passenger’s side and rolled into the ditch by the side of the road. Badly shaken, Armstrong and Ralston decided to leave the chase up to somebody else. The police chief and patrolmen from Mount Vernon, the county seat located just a few miles to the west, arrived about a half hour after the robbery took place. They took up the trail where Armstrong and Ralston had left off, following the getaway car south. Things were going smoothly until they ran across a nest of large roofing nails scattered on the road. A timely shout from onlookers prevented the car from driving onto the nails but by the time things were sorted out, the trail had gone stone cold. The DeSoto simply vanished. The last time it was seen, there were two routes it could have taken. One was to continue south winding through country roads. Or the outlaws could have taken a hard right turn and headed west. Either way it was agreed that the robbery was the work of a professional gang who had carefully planned it to go off with clock-work precision. About a week later, no new leads had developed. Authorities solemnly announced that unless the gang was caught in the midst of another hold-up or one of the gang members decided to rat out the others, there was very little chance of the robbery being solved. After all, only $700.00 had been taken. Undeterred, Cashier Brown stubbornly insisted that he could identify at least the leader if he saw him again since none of the robbers had bothered wearing masks. On October 13th, 1933, Brown and the two customers had their chance to make an id. Two small-time robbers had been rousted by Cleveland, Ohio police. When their apartment was searched, a small arsenal had been unearthed. Both were ex convicts. One had previously been arrested for an attempted burglary in Gambier two years earlier. Initially, the duo had been brought in for questioning about a recent payroll robbery. Besides the attempted burglary charge, the most damning evidence to connect these men to the Gambier bank robbery was that one of the two women arrested with them was a Mrs. Lulu Frye. Evidently she had connections to local bootlegging circles around the Gambier area. However, when the suspects were paraded in front of the three eyewitnesses, no identification could be made. Disappointed, the trio headed back to Gambier. They returned to newspaper headlines describing the murder of Allen County Sheriff Jess Sarber during the jail break-out of John Dillinger the night before. As Brown read the details, he began to suspect that these might have been the ones who had robbed his bank. Shortly afterwards mug shots of the Dillinger gang began to circulate throughout Ohio. Ray Brown took a long hard look. One man seemed particularly familiar. Brown decided that it had been Charles Makley who had led the bank robbery crew. When local authorities learned who Brown suspected, they tried to down-play it. By this time the Dillinger gang had not only killed a lawman but had also boldly broken into a police station in Auburn, Indiana and stolen their weapons. Officials were afraid that if Makley or any of the others heard they were now suspects in the Gambier bank job, they would return for some payback. There was no way anybody wanted the Dillinger gang showing up on their doorstep. Besides Ray Brown’s assertion that he had shot it out with Charles Makley, the professionalism of the robbery, and the roofing nails left scattered behind, was there anything else that would even remotely tie Makley to the People’s Bank of Gambier robbery? Charles Makley exhibited a curious little quirk back when he was robbing banks with his own gangs. On certain occasions, he would target a nearby bank on his route to or from paying a cordial visit to friends and family. Makley had a first cousin on his adoptive mother, Martha Sunderland’s side of the family who lived west of Gambier. Evidently she was sympathetic to Makley’s plight because she visited him while he was in prison. He may have fallen back on his opportunistic “friends and family plan” for the Gambier robbery. Even though they had gotten much more loot from the St. Marys, Ohio job, all of that cash had been brand spanking new and looked the part. Makley and the rest of the Terror Gang were probably looking for a little used currency that would be much easier to pass. And Makley was familiar with navigating the winding country roads around that area, having hit banks to the south and east of Gambier in the early 1920s. A more substantial clue was the license plate of the getaway DeSoto. It happened to have been stolen two months earlier from a Shelby County woman’s car. Shelby County, Ohio is the next county south of the hometown of Charles Makley. He had associates in Shelby County who provided him with stolen plates, cars, and information throughout the years. This Shelby County connection shows up for the first time in the next bank robbery, which occurred long before Makley’s days with the Dillinger gang. Compilation of Robbery Articles from Kenyon College Archives, Aileen Caldwell, personal correspondence, June 2, 2009.